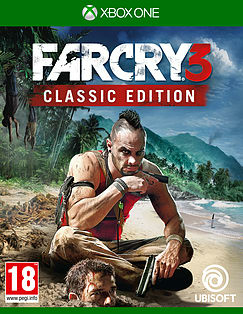 UPDATED GRAPHICS AND GAMEPLAY Far Cry® 3 Classic Edition has been updated to run smoothly on modern platforms and allow fans and newcomers to experience the single-player Far Cry® 3 campaign in stunning detail. UNCOVER A MEMORABLE STORY AND AN INSANE CAST Encounter a diverse and realistic cast of characters, including one of Far Cry’s most notorious villains: Vaas Montenegro. Dive into this deep and enriching story where morals are questionable and hope is all but abandoned. FIGHT BACK IN AN ACTION-PACKED SHOOTER Use an arsenal of weapons and explosives to run gun-first into the action, take down nearby adversaries with your blade or snipe unsuspecting enemies from a distance. AN ISLAND OF DANGER AND DISCOVERY Explore an island playground as stunningly beautiful as it is diverse – from mountain ranges to swampy grasslands and white sandy beaches. Fight your way through the island’s towns, temples, river ports and more.